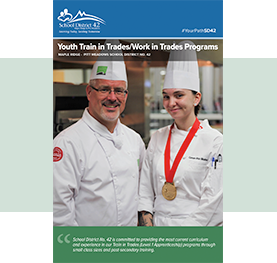 This partnership program between Vancouver Community College and Maple Ridge – Pitt Meadows School District 42 provides a unique opportunity for secondary school students to complete Grade 12 graduation requirements while earning post-secondary credits and certification in the culinary arts industry. Additionally, students will acquire job-ready skills to enter the job market. Adult students who have not graduated may be eligible to take this program tuition free as well. This program covers such topics as preparing grills, roasts, sauces, seafood, soups and stocks. Students will also acquire skills in cooking and baking desserts and learn basic kitchen management including food costing. Students who complete the program will receive a Certificate in Professional Cooking. The program will cover theory and related information along with hands-on cooking practice. This program is located at Samuel Robertson Technical Secondary. Students who successfully complete the program will have completed eight courses for 32 credits on the secondary school graduation transcript. They will also receive a Vancouver Community College certificate.